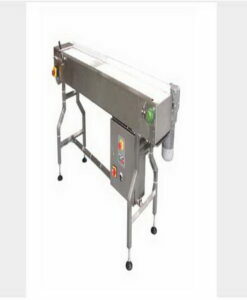 Bottomless Conveyor is a 90° Transfer model allowing production lines to turn 90° and allow for bottom coding during one operation. 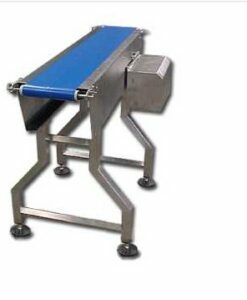 The Accutek Accuveyor 90° Bottomless has variable speeds that will capture a container from one conveyor and transport it to another conveyor using matched frequency gripper belts. The 36″ Long side gripper belts allow access to the bottom of the container for ink jet or laser coding. The Accuveyor 90° Bottomless uses direct drive motors so no transmissions, gears, or pulleys for the drive train are used almost eliminating any maintenance. The brushless AC motors used are frequency controlled so belt speeds are matched further reducing any maintenance issues and ensuring that all codes are straight and legible. The Gripper Belts are independently adjustable and can accommodate containers from 1mm to over 8″ in diameter.